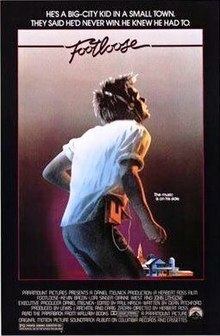 You can talk smack about cheesy 80s movies all you want, but I’ll love them forever and Footloose is probably my favorite. I can’t even estimate how many times I’ve seen it, but it’s more than enough times to have it practically memorized. Just a note: I have not seen the recent remake, nor do I ever plan to. It was a sin that they filmed it in the first place. Disgraceful. Don’t get me started. Ren McCormick (Kevin Bacon) is a big-city kid looking for some fun. But, after Ren moves to the sleepy Midwest, he finds himself in the town that fun forgot! When Ren hears that the town’s uptight minister (John Lithgow) has placed a ban on dancing, he decides to take a stand. With his best friend (Chris Penn) and the minister’s rebellious daughter (Lori Singer), Ren wages a fight for their right to shake, rattle and roll—a campaign that will have the town in an uproar…. Ren: You like Men at Work? Willard: Well where do they work? Ren: No, they don’t, they’re a music group. Willard: Well what do they call themselves? Ren: Oh no! What about the Police? Ren: You ever heard them? Willard: No, but I seen them. We’re definitely on a roll with the 80s movies! Let’s hear more about your favorites! I love footloose. Kevin Bacon is such a great actor. I just watched him last night in “The River Wild”. Love this movie 🙂 I saw someone else feature it too for their “F” post. Sorry don’t know the movie or the actor. Thanks for dropping by to my blog today. All the best with your A to Z challenge. I loved Footloose and though Lori Singer was such a babe. my kids like the update, but Jon Lithgow was the very best as the reverend. I am part of the A to Z and wanted to comment here.